If you’re a homeowner who has been looking for ways to increase the square footage of your living space, but you’re hesitant to build a new addition to your existing home, have you thought about looking up? Unfinished attics are an excellent way to increase the size of your home while avoiding some of the obstacles like zoning restrictions and easement concerns that come with building an addition. Bedroom – Having a peaceful place to slumber away from the noise and activity of the more heavily trafficked areas of your home can be a real blessing, especially for those who have trouble sleeping. Just be sure to include a closet and a window in order to claim the space as a bedroom when it comes time to sell. Media room – Do you have a teenager who needs some privacy and a place to hang out, or do you love throwing home parties centered around films or sporting events? Consider turning your attic into a home theater. Playroom – Perhaps you have smaller kids who need their own space to play without making the rest of the house a mess. Attics made great hideaways for kids, transporting them into their own little creative space. Home office – Do you work from home, or wish you had your own space to pay bills or work on that novel you’ve always wanted to write? A quiet attic office could be just the thing you need. While reclaiming your attic as usable living space helps you avoid some of the pitfalls of building a new addition, they do have their own particular set of challenges that you should consider before diving in. Building codes – You’ll need to follow the “Rule of 7s” in your attic room, which states that at least half of your attic space if seven feet tall and seven feet wide and contains at least 70 square feet of space. In addition, you will likely need to beef up floor joists so they can handle the extra weight of people and furnishings. If you’re planning to use your attic as a bedroom, it will also need at least two exits including a window and a staircase to the rest of the home. Access – If your attic has a pull-down staircase, you’ll need to factor in building a permanent staircase. Straight staircases take up the most room but are easiest to construct. Switchback stairs or spiral staircases take up less room, but remember how much room you’ll need to maneuver furniture up into your new space. Electrical/Plumbing/HVAC – You’ll need to bring in licensed contractors who can determine the requirements of your new space and how they will fit into the existing system of your home. If you’re thinking of adding a bathroom, it’s best to locate it over an existing bathroom or kitchen so you’ll have less plumbing to install. 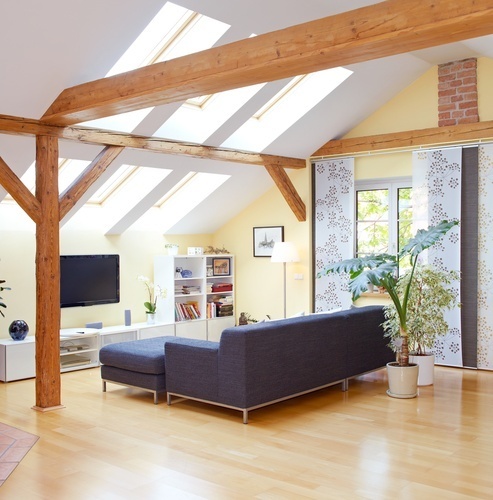 While tackling an attic conversion can be a big project, most homeowners find that in the end, having a brand new living space without constructing an addition was worth the effort.